Hello everyone, I hope you have had time to enjoy all the beautiful Indian summer weather we have been having. I know we have. During our vacation the first week in October, we enjoyed a nice walk on the beach also a visit to the Fryeburg Fair and just enjoyed the warm sunshine while catching up on some yard work. The Fryeburg Fair turn out this year was great, with the weather warm and sunny for most of the week. 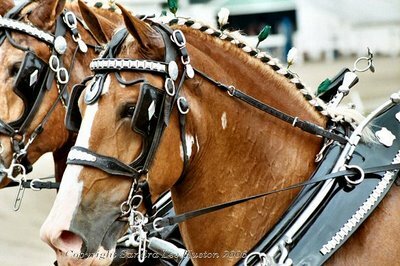 This year I took time to walk around behind the scenes at the draft horse barns and captured some unique photographs of the horses being harnessed, bathed and even captured a few draft teams during warm up before the pulling contests began. The photograph to the left and below are two from the 6-hitch draft horse show held on Wednesday October 4th. 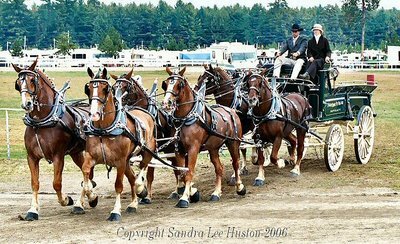 Notice the matching ribbons braided in the manes of the horses matching the color of the wagon they were pulling. All of the draft horses in this show were beautifully presented with their polished harness and shiny coats, all decked out in their best for this spectacular event. If you would like to view more of the draft horse photographs captured that day visit my website at http://www.animalsinpastels.com/ click on the link named My Gallery on each of the photography pages and or the gift shop page. Or click on this link: www.animalsinpastels.com/gallery Look for the sub title horses album and you will view more photographs from the Fryeburg Fair also various new horse photographs will be featured here in the future. I took a total of 6 rolls of film in 2005 and again in 2006 of just the draft show at the Fryeburg Fair, so their is only a small fraction of the photographs displayed. If you would like to know if a particular draft team was captured and you do not see it, please email bornhorselover@aol.com and I would be happy to look through my archives to see if I have one of your team. Please give me the name of the draft breed, color of the wagon, any possible distinguishing marking (or color of ribbons on the horses) that may help me identifly your team. You may come back periodically as more photographs will be added when time permits. This is a new item that should be up and ready to view sometime in November/December of 2006. Here you can go and view all the photographs available to purchase in a variety of styles ranging fro 8x10 digital photographs, to 24 month custom calendars, including greeting cards, 4x6 photo magnets and even bookmarkers. You will also have available an order form to download where you can easily fill in any order you would like and simply mail in to my studio with a money order or check. For those of you who love loons, check out my new loon photographs captured the summer of 2006 at the Tacoma Lakes area. Many have surpassed even the photographs I was able to capture last year that were published in my new book titled "Loons of Tacoma Lakes" in April. For those of you who are not familiar with my book click on this link www.animalsinpastels.com/loons-of-tacoma.html. Here you will be able to read the bio and preface page, also view 12 of the 40 photographs published while listening to the calls of the loons in the background. To date we have sold and distributed over $7,500.00 of my loon book in over 40 locations ranging from Kittery to Moosehead, Maine including independent bookstores, giftshops and sporting good outlets. If by any chance you are unable to locate my book in a location near you, just email me at LoonsofTacoma@aol.com and you can order an autographed copy mailed to your home. I am even extending my free shipping and handling for all individual orders mailed in the US as a Christmas special. For those of you who will be in the Meredith, NH area on Saturday Oct. 28th between 2 and 4 PM stop by at the Innisfree Bookshop where I have been invited to attend a book signing and give an informal talk about publishing my new loon book. I will also have my portfolio of my loon photographs available to view, including some gift items to purchase for all you loon lovers.